It’s funny, growing up, I loved Square’s RPGs, but I really only played two of them – Chrono Trigger and Final Fantasy 6 (originally released as 3 in the US). They just left THAT MUCH of an impression. And not just on me, they profoundly affected Dan as well. Alas, Nintendo losing the license to the Square games resulted in my losing out on playing the games as they came out. It was the main motivation for me buying a used Playstation in college and for eventually getting a PS2. I’ve played way more on my PS3 (which I’ve only had for about a year – 2 years max). Why? Because I kinda lost the somewhat infinite free time I had in my youth. On top of that, when I’ve played through 7, 9, and parts of 8 and 10, I start to wonder if maybe these games were more amazing to my middle school self than they would ever be to my adult self. At the very least, I’m just not cool with all the random encounters. I’m old enough now and have too many other real life concerns to not get through a game as quickly as possible. It’s what I like about modern games like Assassin’s Creed and Arkham Asylum. Want to kill every bad guy and find every hidden treasure? Go for it! Want to run around and kill the main bad guys as quickly as possible so you can enjoy the exposition and get on with it – go for it! But with all the puzzles in the Final Fantasy games, it becomes expensive (in terms of free time lost) to have to backtrack on yourself. I was never one to breed chocobos – I just wanted to find out what happens to the protagonists. 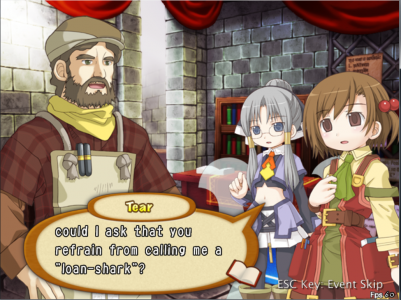 It also doesn’t help that the voice acting in the later games is so bad. And so it seems that a game like Recettear has come at the wrong time in my life. It’s not their fault. Although meta, deconstructionist themes have existed for a long time, it’s only now that they’re beginning to become huge in pop culture. There are movies about the Igor characters, internet shows that portray the bad guys sympathetically, and pretty much everything on adult swim that isn’t anime. (Although, see Excel Saga) So here we have a game about the girl who runs an item shop. And why not have a game about her? 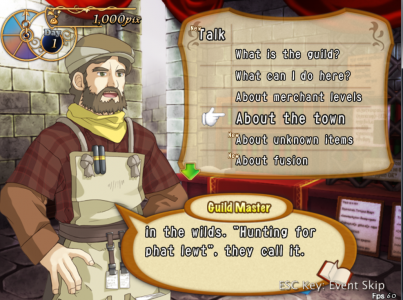 After all, the most important NPC of RPGs (western or japanese) is the item shop owner. He (or she) provides you with the weapons you will use to defeat the enemy and buys back your old, useless weapons. And with our modern sensibilities there’s so much room for humor. After all, you have a string of heroes coming through your shop to defeat this boss or that boss. With the right writer, this could be pure comedic gold. If this game had appeared in my youth, I would have totally eaten it up. I know I would have loved it. As it is now, I think it has the potential to connect to a part of me that I haven’t revisited in a while. If it has a good enough story, it could be like Pacman CE DX – another look at a game from my youth. I’ve heard some good things about it from the Giant Bomb crew. A few of them, like me, loved jRPGs in their youth and have soured on the recent output from SquareEnix (the last pure purveyor of this style). But they’re having a good time with the game. 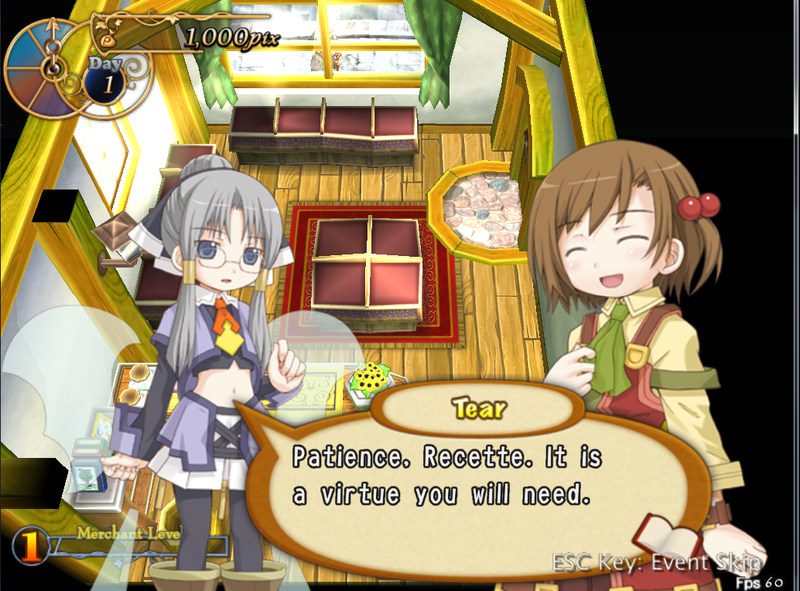 So, it is with this background that I downloaded the demo of Recettear from the Steam store. I figured I could play the demo through its conclusion and get an idea of whether this game was for me or if that era has passed me by. 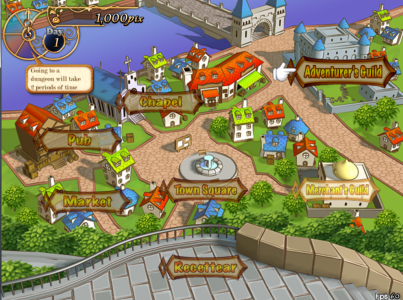 The game is a Japanese dojin game – that’s the Japanese equivalent of hobbiest games ranging from what you find on Linux to stuff like Braid. I didn’t know this going in, but I guessed it as I realized that there were random bits of Japanese dialog in the background. Like if the main character says, “Good morning! I’m so tired this morning”, you hear a girl speak “Good morning!” And of course there’s the obligatory female whining sound that carries over from anime. If all loan sharks looked like this, perhaps they wouldn't be as hated? The localizing team did a really good job. There are a lot of references to Western pop culture like an oblique reference to Buzz Lightyear. I played far enough to get through my first day running the item shop. (The demo didn’t end there – so I’m not sure what the demo’s limitations are) So, is it for me? In a lot of ways, my initial feelings have proven true. This is a game I would have loved 10 or 12 years ago. It looks almost exactly like a SNES era RPG. Nowadays, I’m not just as much into that type of storyline. However, I do love me some economics in my games. It’s one of the things I liked in Assassin’s Creed II and it’s one of the things I like in SimCity or The Sims. So trying to figure out how much to sell the items for in order to maximize profits for the shop could be fun. For now I think I’m going to put it on the back burner. I have a few other games I want to play first and only so much money for games. Sure, it’s only $20, but so are most of the other games I’m looking at (the advantage of buying them years after they come out).